But you know they will. In the coming days you will be denials/spin from every corner. Zardari will deny it. Gilani will deny it. Qureshi will deny it. Kiyani will deny it. ISPR will deny it. Foreign Office will deny it. American Ambassador will deny it. Maybe even Robert Gates will deny it. But you know they will once again be proving themselves to be lying sacks of horse manure. Of about 13,000 US special forces deployed overseas, about 9,000 are evenly divided between Afghanistan and Pakistan. Their use, and the increase in drone attacks, is a strategy that has been strongly advocated by Joe Biden, the Vice-President, but criticised by the governments of Pakistan and Afghanistan. 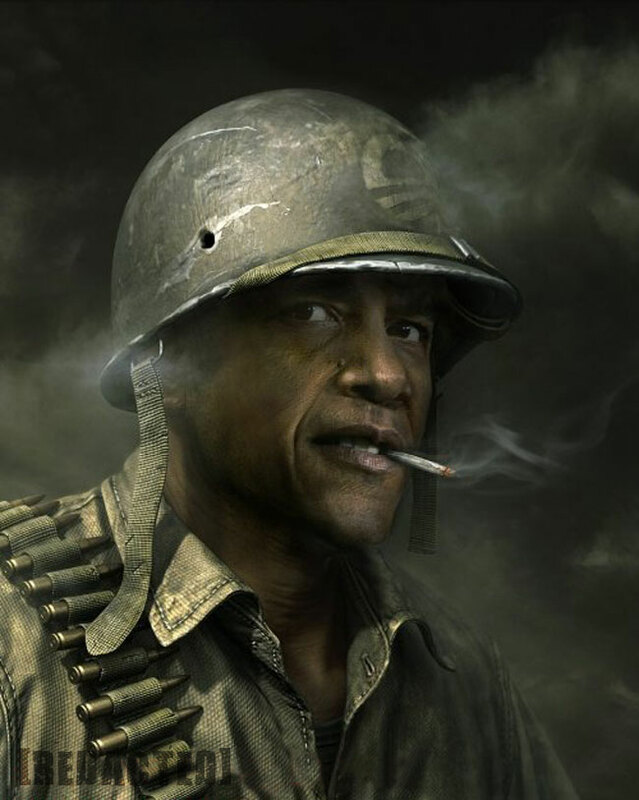 Hundreds of civilians have died in special operations A report last week revealed that the top US commander in the Middle East had signed an order last September authorising a big expansion of clandestine military missions in the region, and also in Iran, Saudi Arabia and Somalia. General David Petraeus signed the Joint Unconventional Warfare Task Force Executive Order on September 30. In the three months that followed there was a surge of special operations troops into Yemen, where US operatives are now training local forces. But don’t say I didn’t tell you about them being over here months ago. This is yet another confirmation from the Devil’s mouth himself. 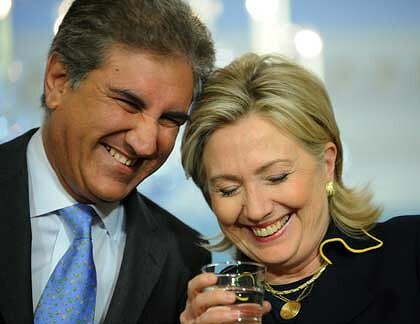 BTW: Isn’t it the same Joe Biden who was given Hilal-i-Pakistan medal by Zardari? And isn’t it the same General Petreaus in whose lap we find Kiyani almost every week (i.e. when they are not out on secret dates on the high seas)? How Can You Kill Marines That Don’t Exist? Did We Conquer Europe Or Something? If you had any doubts about Faisal Shehzad being a patsy, let there be no doubts any more as the patsy had served his purpose: Provide the excuse for launching the North Waziristan Operation. Of course PM Gilani, Interior Minister Rehman Malik, and Foreign Minister were parroting the same so you know they were lying through their teeth. Note: Whenever you see the figure go above 30, you can be assured some American ‘dignitary’ is on a visit. Whenever you see those killed exceed 50, be assured one of our ‘leaders’ is visiting a Western capital. WASHINGTON: President Obama’s national security adviser, James L. Jones, and CIA Director Leon Panetta are visiting Pakistan this week for counterterrorism discussions with top Pakistani leadership. ISLAMABAD – Pakistan’s top political and military leadership met Wednesday to discuss the internal security scenario ahead of crucial talks with visiting US National Security Advisor James Jones and CIA director Leon Panetta. Jones and Panetta arrived here Tuesday evening on a two-day visit. Detailed discussions were held on the security situation in the country, results of Operation Rah-e-Rast against the Taliban in South Waziristan, the situation in Afghanistan, Pakistan-US relations and the war against terror. Chaired by President Asif Ali Zardari, the meeting was attended by Prime Minister Yousuf Raza Gilani, Foreign Minister Shah Mehmood Qureshi and army chief Gen. Ashfaq Parvez Kayani. The sources told Online the meeting of the troika prior to the talks with Jones and Panetta was “unusual and quite significant”. ISLAMABAD: Pakistan agreed in principle on Wednesday to launch a full-fledged military operation against the Taliban in North Waziristan, but candidly told the United States that the timing of the offensive would be decided by it. “Pakistan is sincere and committed in combating terrorism and is ready to expand its anti-militancy operations to North Waziristan. So the patsy (Faisal Shehzad) had served his purpose. Besides the contract for indiscriminate killing in North Waziristan, another agreement was also signed that is not getting the press it deserves: It was decided to open a full-fledged U.S. Consulate in Quetta with “enhanced presence of C.I.A.” there. That should go over well to stabilize Balochistan — NOT! Then why hasn’t he fired him? A Quickie: So That’s What They Were Toasting? 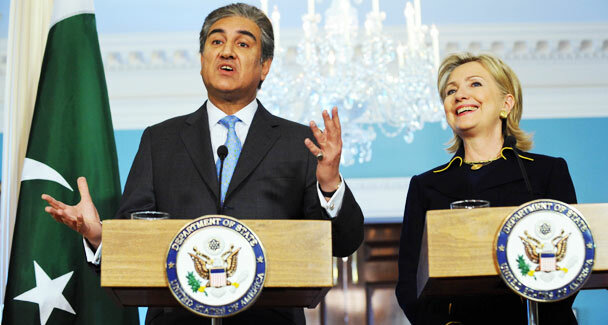 "Today, I am a happy and satisfied man"...Pakistan's Foreign Minister, Shah Mehmood Qureshi, with the US secretary of state, Hillary Clinton, in Washington. Photo AFP. P.S. On the subject of Aafia Siddiqui, Gilani stated “It is not possible that our delegation will not raise these issues during the talks.” That certainly confirms for me the issue will not be raised.